Solvent printing is more relevant in your everyday lives than most of you may think. Banners, stickers and decals are just a few of the very common products printed with a solvent printer. The pickup truck with the bald eagle and American flag on the back window – created with solvent printing. The sticker in your car that says when you need to get your oil changed next? Also, made with solvent printing. Solvent printers traditionally range in size between 30” to over 100” wide and start at about $15,000. After you print on your roll of media, you will need a vinyl cutter to contour cut the finished product from the main roll of media. There are even printers available that have that have a built-in cutter, but it also has its disadvantages, which I’ll discuss later on. A few years ago, it was discovered you could print onto heat transfer vinyl with a solvent printer and transfer it to garments. This was a game-changer for apparel decorators who needed a solution for short run orders. No more turning down an order for two shirts and more money in your pocket. However, there was one problem that these apparel decorators were running into – the initial investment of a solvent printer and vinyl cutter was upwards of $20,000. That didn’t make financial sense for somebody who will only be using the equipment for short-run apparel decoration, not to mention the large amount of space a 54” printer takes up in a workshop when only 20″ of that printer was actually needed. So in 2011, Roland introduced the BN-20 all-in-one printer/cutter. It was the first desktop solvent printer and it was perfect for users who wanted to create smaller products like garments and stickers. Media manufacturers began offering all of their medias in 20” widths for the BN-20 users to use. Over the last few years, people began to get frustrated with the speed of this printer as well as the price point, which was $10,000+. Mutoh took note and, in the summer of 2014, released the ValueJet 628. The VJ628 24” solvent printer rivals the Roland BN-20 in every way. The print speed is about 10 times as fast as the BN-20 and the quality matches that of a standard size Mutoh solvent printer. At first you may not like the fact that you have to have a separate vinyl cutter, but watch the video below, and you will see why I stand behind this product so much. Most of you probably already have a vinyl cutter and if you do not, we’ve put together a package with this printer and a 24” Graphtec cutter and it is STILL priced lower than a Roland BN-20. Now that you know what solvent printing is and have a brief understanding of the Mutoh 628, I am going to tell you what media to use with it and what markets to sell it in. Garment decoration is one of the main uses for the smaller solvent printers. 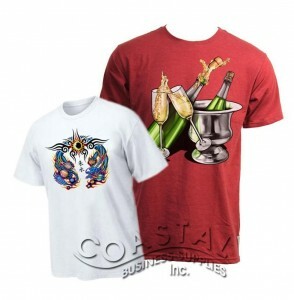 Coastal has a wide variety of printable heat transfer vinyl and we even offer a comparison chart to help you determine which is best for your needs. These materials are great for short-run jobs and have a major advantage over heat transfer paper due to the soft hand and durability, which is comparable to a screen print. There is no need to have a 54” solvent printer if you are only printing stickers, unless of course your sticker is 54” wide, didn’t think so. We have a couple recommended sticker/decal media available in the 24” width. The most important part of this whole process is making money. There is no reason to purchase any of this equipment if you can’t get a good return on your investment. The Mutoh 628 is a very profitable piece of equipment and there are numbers to back it up. The average media for a solvent printer is about $0.30 per square foot and the average ink cost per square foot is about $0.20 Bringing the cost of consumables to about $0.50 per square foot. A standard sticker is about 4”x4” and costs about $0.055 in consumables. 50 custom 4”x4” stickers on stickermule.com sells for $69.00 or $1.38 each. That is over a 95% profit margin!! Even the printable heat transfer vinyl has a great margin. The Coastal Solvent vinyl is about $1.25 per square foot and the ink is the same at $0.20 per square foot. So your cost of consumables for garment is about $1.45 per square foot, which is about the average size of a printed graphic for a garment. If you are purchasing your blank shirts in a decent bulk quantity you are not paying more than $3.00 per shirt. For a short run t-shirt shop (1-10) shirts, a customer can expect to pay at least $15 per shirt. Bringing your profit on each shirt to over $10! Again, that is a margin of about 60-70%, which is great in this industry!! One of the biggest aspects to any printing is color. It is very important to make sure you are meeting your customers’ expectations when printing color. The Mutoh 628 has a RIP software that communicates between your printer and your graphic design software. It is basically telling the printer to lay down this much ink of this color to make the image appear on the print as it does on screen. Each media will take a different amount of ink to achieve the same color. So it is important to make sure you select the correct color profile for the media you are printing to. Have more questions? Call (800) 562-7760 and ask for Alex! 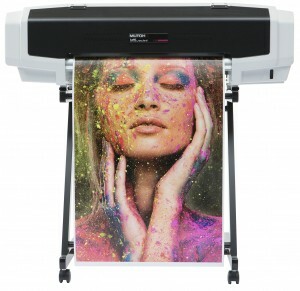 Check Out the NEW Mutoh VJ628 24″ Printer! For far too long, solvent and eco-solvent printing has been a process only attainable by large, high-production print shops, and most people are unaware of the applications beyond simple sign, label and banner prints! Now, the market is rapidly changing, and Coastal Business Supplies is thrilled to introduce the Mutoh ValueJet 628 (VJ628), a 24″ wide solvent printer that is PERFECT for a spectrum of solvent uses. Immediately your shop will be open to the ability to print high-quality garment transfers, stickers, and decals with inks resilient and strong enough to be outdoor, weather, and waterproof. Plus, with a vinyl cutter, you’ll be able to produce amazingly easy to apply heat transfer materials with a higher-quality image reproduction than possible with other methods of decoration. And because the ValueJet 628 printer is only 24″ wide, it only takes up a small footprint in your shop, but it’s benefits travel far, especially with a significantly lower price point than the 44″ and wider machines! Enter this extremely profitable industry of solvent printing with the addition of a Mutoh ValueJet 628 to your print shop — you won’t regret it. Looking for more information on the purchase or lease of your new best friend? Give our Professional Solutions department a call today a 1-800-562-7760 or send us an email at info@coastalbusiness.com.